Avascular necrosis (AVN) is one of those “oh crap” diagnoses. Much like cancer or some other awful malady, it sneaks up on you and there’s usually no clear explanation about how it happened. All of a sudden your life is thrown upside down and you’re searching the web for avascular necrosis treatment or surgery options. This is what happened to our patient Julie Cerrone. One minute she’s an active young woman who’s going places, the next she’s on crutches with her life on hold. All Julie wanted for Christmas was to get off those crutches, which was a present that Dr. Pitts at our Colorado facility was able to deliver this year. Avascular necrosis goes by many names, AVN, ON or osteonecrosis. This means that the bone has died off, which often leads to collapse of the structure and then usually severe arthritis in the joint that’s closest to the bone. Patients usually have no idea how they got it, but the most common known and easy to track cause is anti-inflammatory steroid use. AVN patients are usually told to either undergo a joint replacement or aggressive surgery and in the meantime, get on crutches and just hope for the best. It’s as if their lives are suddenly placed into indefinite suspension. Julie’s story is typical. One minute she was an active young woman who was going places, the next she’s told she has this awful disease and needs a knee replacement. Unfortunately, for someone her age the math around knee replacement didn’t work out. She would still be a relatively young woman when the estimated lifespan of two consecutive knee replacements reached its end. Additionally, most of the 15 doctors she went to wouldn’t even consider the joint replacement because of her autoimmune issues. Suffice it to say that she was in a “no win” situation. Speaking with Dr. Pitts at our Colorado facility about Julie, he says that she’s one of the sweetest and most positive patients that he’s met. He recalls just before her procedure that her father gave him a look that said, “Don’t mess up my little girl”. Like many patients, Julie turned to the Internet. At first it was just to stay sane, a way to connect with other people whose lives had been interrupted and placed on indefinite hold by this awful disease. Later it became a passion, as she increasingly found herself representing the patient’s voice on major medical web-sites like Web-MD and at conferences. I’ve always loved the holidays, as Christmas was a big deal at our house growing up in a family of 7 kids on Long Island and that tradition has continued at our house in Colorado. Julie also loves Christmas and friends began asking why she didn’t just put lights on her crutches. 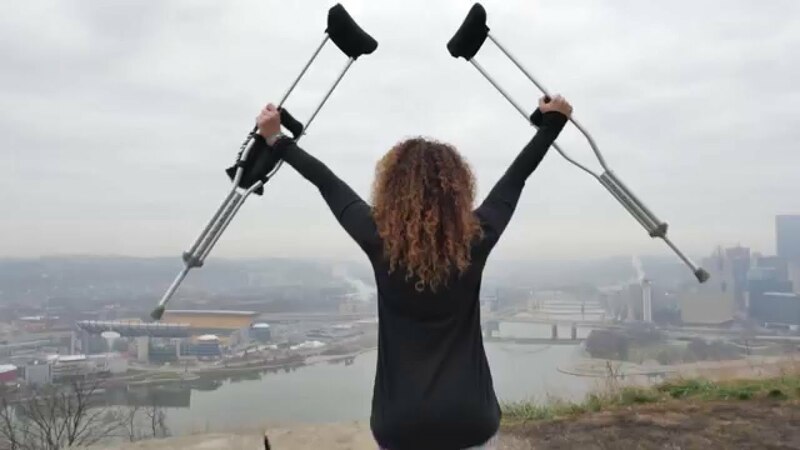 Like most patients would, she thought to herself that she wouldn’t be on these silly crutches for long, so there was no reason to make them that big a part a part of her life. However, as the Christmases flashed by, all of a sudden last Christmas became her third with those damned crutches. She knew there had to be some way out of this mess. Julie is a savvy Internet researcher, so she looked up all the newer treatments for AVN, coming across stem cells. However, like many AVN patients, she could see that some of the treatments being proposed were half baked. Some were overly aggressive, basically taking old surgeries like CORE decompression and throwing in stem cells like magic pixie dust. Then she came across Regenexx, and she knew something was different. These doctors used precise imaging guidance to get the stem cells into the dead bone through an injection. They had also treated hundreds of patients with bone diseases over the last decade. There was even research backing up the procedure they used. So in February of this year she took the plunge and decided it was time to pull the trigger on the Regenexx stem cell procedure for her AVN. Speaking with Dr. Pitts at our Colorado facility about Julie, he says that she’s one of the sweetest and most positive patients that he’s met. He recalls just before her procedure that her father gave him a look that said, “Don’t mess up my little girl”. He took that non-verbal advice to heart and carefully guided her high dose isolated stem cells precisely to the exact spot where the bone had died using fluoroscopy. Julie’s results are on her blog, “It Just a Bad Day, Not a Bad Life”. However, if you want to get a great sense of what happened, there’s another masterful video produced by Doug Orchard above where she describes that her Christmas wish came true…no crutches for the holidays! Her MRIs have improved and Dr. Pitts is working with her on next steps. The upshot? Julie’s story is an inspiration to us all here at Regenexx. It’s become our video Christmas card to our patients, friends, and family. So have a wonderful holiday and take a few minutes to bathe in the love, caring, and wonder this year, while remembering that there are people like Julie out there who are celebrating the things we all take for granted! Love that our daughter, Julie, is featured as your digital Christmas card!!! It has become ours as well. Watching her take those first steps, without those worn out crutches, will forever be etched in our minds. MERRY CHRISTMAS to Dr. Pitts and your entire hardworking and friendly staff. Julie so echoes all we strive for at Regenexx and was a joy to all who she came in contact with here. I have passed your Christmas wishes along to Dr. Pitts and staff. We wish you and the whole family a wonderful, joyous Christmas from all of us! What an inspiration! Way to take control of your health and your life! I am wondering if you could help my 60 year-old son who has had AVN in shoulders and hip for many years. Our first European location, Regenexx Belgium opened recently in Brussels. London to Brussels 2hr 10 mins on Eurostar! Here is their website: http://oreme.eu/ If you need assistance in reaching them, please call 888 525 3005, M-F, MST, and we'll be glad to help. I have AVN if the talus and feel it is related to the MTHFR mutation as I have no other cause of the AVN. I’ve been an ER nurse for 17 years so you can imagine how much I need to walk and be on my feet. I was an avid runner doing fulls and half’s and had signed up for two half’s then in March of this year it all came to a halt. I’ve had 2 MRIs (last one in August) and no change. I can tell it hasn’t improved despite restrictions. I was allowed to walk first week of August and then gradually Walk at work last month. Can I get more info? Does my ortho/podiatrist need to refer me to you? Nov 14th will be 8 months of restricting activity as well as the NWB in that mix. I haven’t given up hope of running yet despite what others have told me.